Opportunities to donate flowers will come along very often. The best way to show up at every opportunity? Fasiflor! At Fasiflor you will find the right solution for your every need. Flowers, plants, arrangements, decorations for weddings and other events. 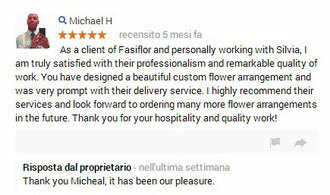 What better describe us is... our customers reviews!! We speak English and French and we will be pleasured to help you meeting your needs.